Today is the day that those all over the grid remove their hair to show they care. Not removing your hair doesn’t mean you care any less, but this is a fun tradition we started in 2007 and it has grown every year since. 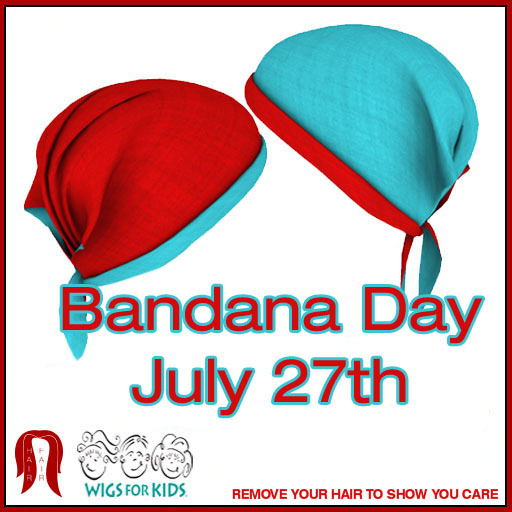 Bandanas are created from people all over SL, by creators, bloggers and Second Life residents, who just feel inspired to open up a photo editing program and do their part to help us help Wigs for Kids. The Bandanas are only available at Hair Fair 2014 and once the event is over they are never purchasable again. The bandanas are sold for 50L and you can transfer them to friends, people even have bandana wearing parties, and events that also help bring awareness to Hair Fair and Wigs for Kids.